Detail of the Dendera temple ceiling showing some of its many constellations. In this astronomical timepiece, the vernal equinox would serve as the pointing hand, marking the Suns position against the background constellations on the first day of spring when day and night are of equal length. Due to the precession of the Earths poles, the vernal equinox slowly shifts backward through the signs of the zodiac with the forward advancement of time. 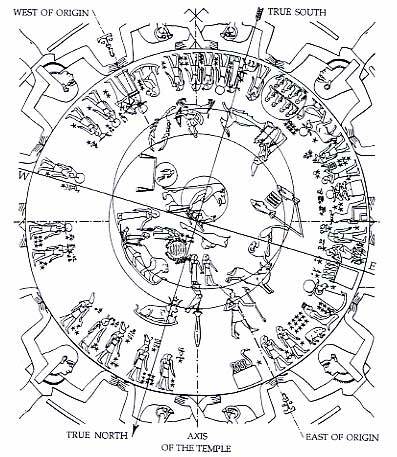 It takes about 25,700 years to make a complete circuit of the ecliptic, an interval that in ancient times was termed a Great Cycle.